Have you ever lost your instructions or forgotten how to assemble one of your JP toys? Well have no fear - just visit our new Downloads section today! That's right, for the first time anywhere on the web, JPtoys.com is proud to bring you the actual instruction guides for some of your favorite JP toys! We have more cool downloadable items planned so make sure to keep checking back. Keep in mind though that these scans are only made available for your assistance and enjoyment - not for monetary gain. In other site news, be sure to head on over to our Customs section if you haven’t lately. We have new additions from our own Armothe & some new entries from Velociraptoryx as well. Next up for us, the new & improved toy archives! So stay tuned for that and have a great weekend! JPToys is proud to kick off the Customs section by featuring Armothe's latest creation - the Sahara Spinosaurus! Granted, that's the only one, but we are looking for more member submissions! JPToys is willing to either host, or link to your custom creations. This might be the ticket for the person who doesn't have a website, or perhaps their host is just plain unreliable. Contact the JPToys Staff to inquire about this awesome opportunity! (Update - 8/22) Plenty of new customs entries have been added - check them out! So how was everybody's weekend? Mine was rushed as I spent half of it in Atlanta at a convention and the other half learning how to kayak. I had a great time but my body is starting to tell me otherwise! Also, today I turn the big 23! What a way to spend your birthday - in pain! Now, on to the updates. First up, we have a new review from "jpworker" of TLW Sarah Harding. Pretty good review so make sure to check that out when you get a chance. Also today as you may have already noticed, we have a brand spankin' new poll question! Last time we wanted to know what your favorite JP vehicle was and the overwhelming winner with 54% of the vote was the Jungle Explorer (which I must say - I agree). This time we want to know what your favorite TLW vehicle is. So cast your vote now and we'll have an overall favorite poll with each of the previous winners soon! Something interesting to note here is that Joe found them in a retail store. 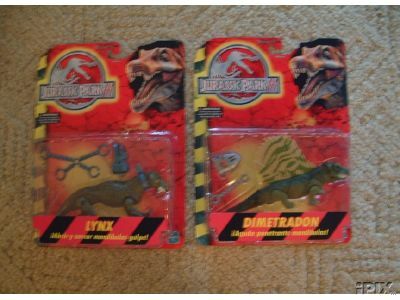 According to him, they came in little plastic bags and the description on the back read: "Terrifying dinosaurs hunt people named Alan Brant, Bobby Breenan, and Erin Kirly! Collect them all!" He also went on to say they had a Spino, T-Rex and a Dilo but the quality wasn't as great on them. It definitely looks like someone is trying to make a cheap buck but the quailty on these two guys isn't half bad...I'd buy 'em! These were spotted in a recent eBAY auction. Chalk up 5 more for Mexico! Unlike the other ones, these dinosaurs are actually mentioned on the back of the cards. JPToys TOY PRICE GUIDE LAUNCHED! You asked for it...... and JPToys is pleased to give it to you. 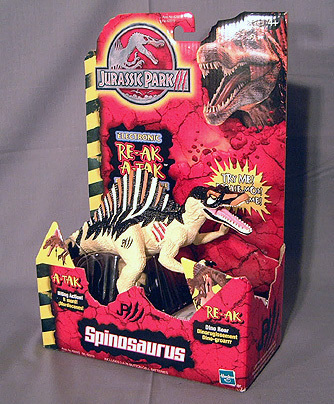 The Web's first and only online price guide for Jurassic Park toys. Tired of spending $6.50 on an out-dated paper-back price-guide each month? Written and maintained by hard-core JP collectors, the JPToys price guide appeals to both collectors and sellers. The guide boasts over 300 accurate and complete entries to assist you with your selling or buying needs. You can find the guide by clicking on the link in the nav-bar, or going here. Don't forget to check out the FAQ! So, what's next you might ask? Be sure to check out our new and improved nav-bar for your first big clue! Have a great weekend everyone!